A grandson tries to buy Lenin's corpse on eBay for his Communist grandfather. A failed wunderkind steals a golden cross from an Orthodox church. Every five years, a boy meets his cousin (the love of his life) in the river that divides their village into east and west. 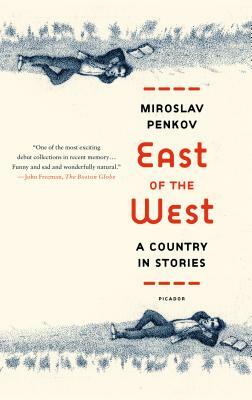 These are Miroslav Penkov's strange, unexpectedly moving visions of his home country, Bulgaria, and they are the stories that make up this beguiling and deeply felt debut. Animated by Penkov's unmatched eye for the absurd, East of the West is a brilliant portrait of a country with its own compass. Miroslav Penkov was born in 1982 in Bulgaria. He arrived in America in 2001 and completed a bachelor’s degree in psychology and an M.F.A. in creative writing at the University of Arkansas. He has won the Eudora Welty Prize in Fiction, and his story “Buying Lenin” was published in The Best American Short Stories 2008, edited by Salman Rushdie. He teaches creative writing at the University of North Texas, where he is a fiction editor for the American Literary Review. He is the author of East of the West.